Rock on Richard Coeur de Lion II, voice of the Lion, the DJ Lionheart of Richard LIONHEART XLMAX, ROCK on XLMAX, spinning for you the Lionheart Listener all of the grrrrrreatest Rock n Roll hits of the 50s, 60s, 70s, 80s, 90s, Naught-ies and Now! Presenting all of your favorite, classic, Rock n Roll bands, introducing grrrrrrooovy, new up and coming independent bands from around the world plus a bit of comedy, important Sea Shepherd conservation news and a dabble of populist, political dialogue pertinent to both sides of the pond. 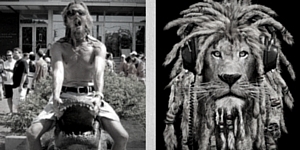 If you'd like to see or hear more of our DJ Lionheart outside of Lionheart Rock time, Richard is also a professional film actor & stage fighter, the Lion can be seen doing battle in "Thor 2; The Dark World", in the notorious church fight scene in "Kingsman; The Secret Service", "Pan; The Prequel to Peter Pan and the soon to be released, "Macbeth". But his most famous of all TV credits has to be having had a small part in the final leap in the cult classic TV series, Quantum Leap. Meanwhile, back in the world of voices, RCdLII can be heard singing the title track and all the Christmas carols in "The Mr Men Christmas Special", voicing Private George Alex in "D-Day In Colour", narrating Sherman Alexie's "Do You Know Where I Am" for BBC Radio 4, as the voice of Buzz Aldrin in The History Channel's "The Moon Landing" and doing a few different voices in the soon to be released online video game "Fractured Space". For further credits or a full work history, please have your agent call my agent, we'll do lunch!